This year, my school got 1-to-1 technology through a grant, so I’ve been figuring out how to use tech with CI!!! It’s been really fun, and one of my favorite tools is Socrative!!! Socrative is the most amazing exit quiz tool ever! You can do multiple-choice, true or false, or open response questions. You can pre-build quizzes or do “Quick Questions” where you don’t have to plan anything ahead of time. 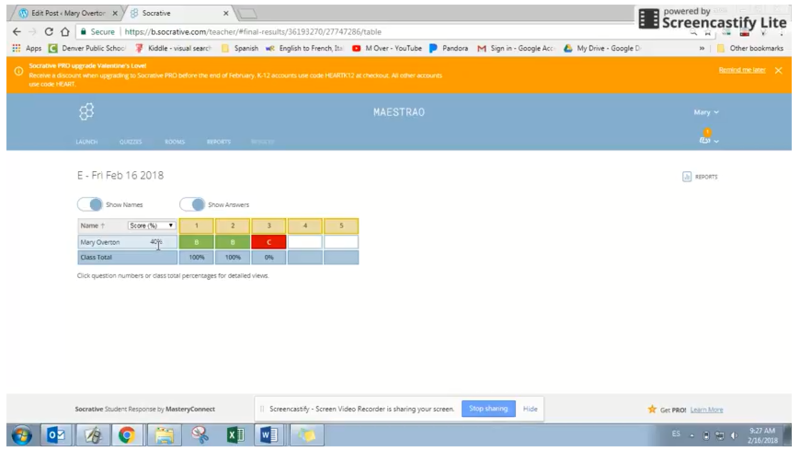 There are a variety of different settings for giving quizzes including teacher paced, students getting immediate feedback of right or wrong answers, students entering their names or answering anonymously, among other things. I have been using Socrative mostly for exit quizzes. For this, I created a 5-question, multiple-choice quiz template that has 3 answer choices: A. Cierto B. Falso and C. Ayúdame/No sé. I have copied and pasted this template many times so that I have multiple versions. But…..here is the MOST important step. Once you have created multiple versions of your template, be sure to set your correct answers. What I mean is if you know that the answers to Exit Quiz Template Q are in the order: 1. True 2. True 3. False 4. True 5. False, it is IMPERATIVE that you ask your exit quiz questions in this order!!!! If you don’t, then, the wonder that is automatic grading won’t do its magic, and you’ll be sooooooo sad (or you’ll just use your intelligence when looking at the results knowing that you asked a question with the incorrect right answer and fix it next time!). I LOVE efficiency, so I have figured out a few tricks for making Socrative work best for me. I have 2 Word docs pinned to my toolbar that list my Socrative instructions. I post these instructions and freeze my projector. Then, I launch one of my pre-built templates and students enter their names or student numbers on their computers (I’ll admit that I sometimes forget this step until a student reminds me that they can’t yet enter their names!). From there, I ask my quiz. Again, I have gotten really efficient about this. I hand out three notebooks* daily to my fast-processing students, and they serve as the author, quiz writer, and artist for the day (See Ben Slavic’s site for more info about class jobs). *Just yesterday for the first time, I had one of my authors do her writing on her Chromebook instead of in the notebook per Annabelle Allen’s suggestion at CCFLT, and it was AWESOME! The student emailed me the nearly-perfectly written story IN SPANISH before class was even over, and we’ll be reading it today in class!!!!! When it is time for me to ask the quiz questions, the quiz writer hands me the notebook of questions and comes up to my computer. As I ask the questions, the quiz writer’s job is to click the “Next” button as soon as 35/35 students have answered each question! It’s awesome because she or he just gives me a thumbs up when it’s time for the next question so I can walk around the room as I give the quiz thus increasing accountability via proximity to students. Once I finish asking the quiz, I click Finish and the results are immediately available AND GRADED!! It’s possible to view them on the website or download them to your computer as an Excel Doc. One colleague of mine, Karen Carmean, uses these results immediately to shout-out students and initiate conversations as needed. Sometimes my results are just a check-in and other times they are my Interpersonal and/or Interpretative grade for the week! Let me know if you have any questions or suggestions. Click for a video demo!